Teeth whitening is more than a passing trend created by celebrities. It's a valuable service offered by Downtown Dental year-round. We treat the discoloration and yellowing of our patients' teeth upon request. The amount of bleaching that is done depends on the amount of staining that is present on the enamel. It may take us more than one session to fully brighten a patient's smile. In fact, we customize the service based on men and women's needs. Some prefer to whiten some teeth. Others want their entire smile brightened. The amount of teeth whitening that takes place is up to the patient. When the discoloration is too severe, we recommend veneers. They're fitted over a patient's teeth and look like a person's natural smile. It's the most cost-effective option for people who have spent a lifetime smoking, drinking dark beverages or taking certain types of medication. 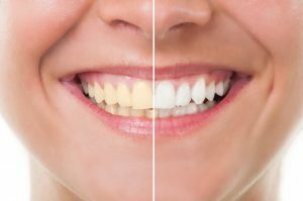 Bleaching has long-term effects but does require routine whitening services if a patient smokes, drinks or takes some medications as noted above. The benefits of this service are numerous. Not only do bright white teeth improve a person's appearance, studies have shown that it makes people think they're younger, too! A bright, white smile gives a face an instant facelift. It restores our patients' confidence and provides them with opportunities they may not have had before. The process is painless, affordable and an investment that produces noticeable results with white teeth. Some of the other benefits that come with whitening services include expert knowledge. Our dentists believe in empowering our patients by giving them the information they need to maintain their bright, white smile. This prevents future issues with discoloration and yellowing. The level of satisfaction a person feels with our teeth whitening services is noted in the testimonials and reviews we receive from patients. They know that Downtown Dental Services puts them and their needs first. The right dental services treat patients like family. They build long-time relationships with them. That's how we do it with the men and women that visit our office. We go the extra mile to make sure that they receive the care they deserve from our dental professionals. If a patient is looking for a new dentist because they've just moved to the area, we want to be the first name that comes to mind. We also want our patients to refer family and friends to us. We want to brighten their smiles, too. Since a smile is a calling card and often the first thing a person sees on another person, it's important for everyone's teeth to look their very best! Another service that we offer our patients is Zoom Whitening. It is among the most popular whitening techniques available. It can only be done by a professional who has access to variable-intensity light technology. What's impressive about this whitening process is that is customized for each patient. Depending on their specific needs, Zoom Whitening can make teeth up to eight shades whiter in a single application. Desensitizers are regulated for each patient, too, making the process pain-free. In less than an hour's time, our patients can walk out with a completely different smile than they came in with. That's a great way to spend a lunch break or time off from work. It doesn't matter how yellow or dull a person's teeth are initially, we work magic on all types of smiles. Don't let a dull smile halt progress. Contact Downtown Dental Services to set up an appointment to have teeth bleached or whitened using Zoom Whitening. We're committed to serving you and providing you with the million dollar smile you admire on other people.